A comprehensive list of golf clubs in Scotland is on the UKGolfGuide website. There are a number of high quality hotels and Bed & Breakfasts near to the Strathpeffer Spa Golf Club.Our website sponsor is the Ben Wyvis hotel in the centre of the village. The Pavilion in the centre of the village is an internationally-renowned venue for a wide range of events including rock, orchestral, traditional, country and folk music concerts. It also hosts weddings, conferences, exhibitions and parties. Full details of what's on and what can be provided is on the Pavilion website. Catering is available in the Clubhouse 7 days a week. 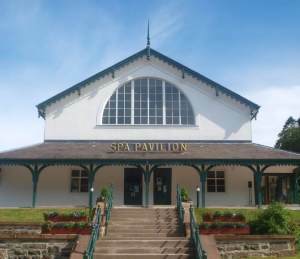 But Strathpeffer also has several cafes and hotels that server food to visitors and a well-renowned restauarant at the Pavilion, the Red Poppy.